Transient is an EP born out of frustration with the world surrounding the musicians that created it, and vocalist Dorian Cooke said that the EP was given this name because every time the band tried to find structure and comfort in one location of their lives it transcended to a feeling of discontent and longing for something better. 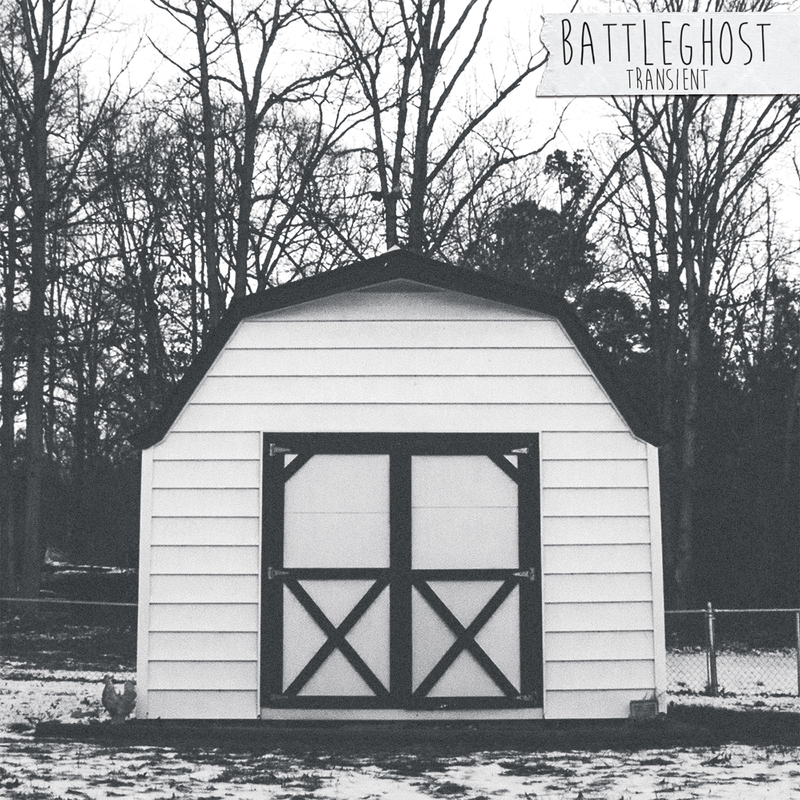 Pop-punk is a genre that thrives off of this need for escape, and music composed with an honest, unreserved nature often sounds the best, which is definitely the case on Transient, Virginia band Battleghost’s forth EP following last years Don’t Be A Hero. Over the past few years since their formation they’ve steadily made a name for themselves, and after tours with State Champs and Man Overboard they’ve returned sounding better, and more confident than ever. Transient is a thrust towards big-time, and considering how good it is any lesser outcome would be a shame. The EP begins with a short intro in Mumbles which packs towering instrumentation and leads straight into Stateless, which opens with trademark pop-punk riffs to kick off the EP’s most ‘traditional’ track in a sense. Even though it sounds familiar Stateless sounds fresh as well, and it marks an instant improvement on the bands past releases. It sounds much more crisp and clear as a result of slicker production and the tracks here sound huge as a result, opting for a more honed and mature approach that sits well, adding something extra to Battleghost’s music that helps set it apart slightly. The melodic, dancing guitars shine through the noise, whilst drums are powerful and adventurous to match, meaning that songs find the ideal balance between melodic and meaty, offering up hooks aplenty alongside churning, dynamic instrumentation which is more technical than is perhaps expected from the genre. At times there’s perhaps too much going on, but Transient most likely contains everything you love about the genre and conveys it all exceptionally, and it’s an EP that’s almost impossible to resist once Stateless bursts into life. Brilliant third track Contentions delivers much of the same in the best way, beginning with a short electric guitar introduction that sounds very similar to Take This To Heart by Mayday Parade (although that might just be me) and it’s another contagious track which is well thought out and just as well executed. Lyrically Transient is around what you’d expect, but it’s more personal and intimate than the bands past releases. Occasionally the lyrics are difficult to pick out but upon reading deeper each song is very well written, often with the writer lying in bed and reliving / regretting on a nightly basis. Contentions features the lines ‘I drift away but I can’t sleep / I built disarray right above my feet / Can’t say I’ll stay but I can’t say I’ll leave / I’ll never know how to say what I think’ and lyrics of this self-doubting nature are often and relatable on Transient. Closing track Cogbill details a relationship with an aging Grandfather, and I went through a similar experience a few years ago when my Gran faded and then passed, so this song hit particularly hard with myself, especially the final few verses which are laced with a painful nostalgia. It’s one of the most compelling and effecting narratives I’ve heard from the genre in a while now, and it’s backed up by more dynamic instrumentals that fit perfectly. The songwriting here is flawless, and it makes Cogbill my favourite track from the EP, and it’s a great finale that ends Transient on a high despite its content. Whereas the lyrical side is written from a trapped perspective every other aspect of the Battleghost’s music bursts free, and it makes for an EP which sounds incredibly comfortable. They sound self-assured without showing off and across their EP’s fifteen minute length not one of them is wasted, with the band seizing every opportunity to impress, offering up creativity and talent in a pleasing abundance, especially on fourth track Locust Grove which begins mellow and gives way to great drumming courtesy of Nick Craven, who excels throughout, eventually reaching a more traditional bounce in its riffs and sweeping vocals before a huge chorus. Towards the end it drops off again, only to surge back for an epic final thirty seconds featuring the EP’s most aggressive and strained vocals, showcasing Cooke’s excellent range. His delivery is exactly what you want from a release of this nature, and although he doesn’t reach as far as past tour-mate Derek Discanio (of State Champs) he pushes constantly and delivers continuously, and his fast, whipping vocals are perfectly weighted for the heavier moments whilst he takes a step back for the softer occasions. As a whole, Transient is a fantastic EP with very little to fault, and it marks a solid step forward for the Virginia natives, who’ve delivered one of the genre’s best shorter releases of the year so far. At times it’d perhaps too dense, and some tracks suffer slightly as a result, but that’s my only real issue. Fans of the genre will find plenty to love musically, whilst the thoughtful lyrics sit well with someone like myself who prefers a little more depth to their pop-punk. Check out the video for Stateless below and prepare for this band to really blow up, because with Transient there’s no reason why they shouldn’t.